I participated in my first Olympic triathlon (1,500 meter swim / 40k bike / 10k run) this weekend - the Chattanooga Waterfront Triathlon. My plan at the beginning of the season was to race at least two Olympic tris prior to my Half-Ironman, figuring I could use the experience. 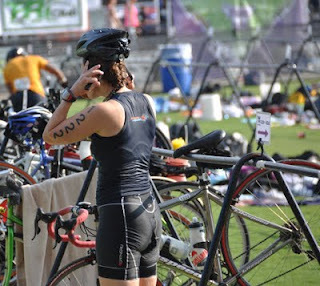 Two options for me to race were the Chattanooga Waterfront Triathlon and the Music City Triathlon being held on July 23. (While I toyed with the idea of doing both, I decided that a race in July and a race in August would probably be a better plan.) I chose Chattanooga because, honestly, I thought it would be the easier of the two. According to previous race reports, the bike in Chattanooga was difficult and hilly, but the swim was point-to-point with the current and the run was generally flat. Compare that to a swim against the current in the Cumberland and a run up the pedestrian bridge in Nashville and the decision was easy - Chattanooga. After catching up with fellow racers Rae and Holland (from the Mach Tenn tri), Dudley and I headed back to the hotel for a good night's rest. Unfortunately, I had crazy anxiety about this race and sleep didn't come easily. When I finally did sleep - I had a crazy dream that the tri organizers had added a new talent category to the tri. Sad thing was, I had no idea what I was going to do! And I'm a singer!! So I even had added anxiety in my dream! Needless to say - I wasn't rested when that 5:00 am alarm rang. Oh well. I generally don't sleep well prior to a race so I wasn't too worried about it. So we headed down to the transition area and get things set up. One thing I learned during this race - I carry too much crap. Two very experienced racers next to me only had their shoes (running and cycling) and their bike helmets. All of their hydration and nutrition were already on the bike. Me? I had crap everywhere. Shoes (running and cycling), socks, Clif bars, Honey Stinger waffles, running water bottle, sunglasses, running hat, towel...the list goes on. Heck! 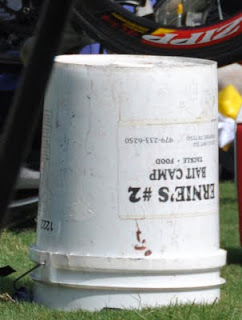 I even brought a bucket to sit on! Well, it was a dual purpose - something to carry all my stuff and something to sit on. Point being - I definitely have to work on that. 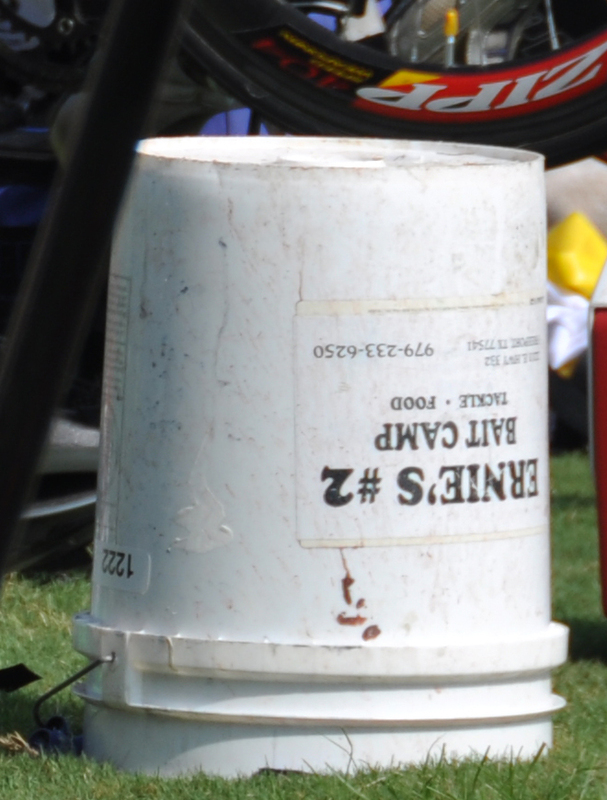 My Ernie's Bait Camp bucket. The bucket belongs to hubby. I have no idea where Ernie's Bait Camp is. 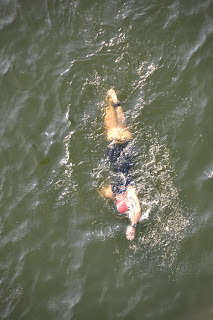 Being that this was a point-to-point swim, we had to get on shuttles to get to the swim start. I felt a small twang of panic when we passed the 1-mile marker for the run. 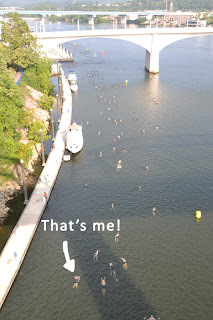 How far was this swim that we were passing the 1-mile mark?! I mean, I know 1,500 meters is ALMOST a mile, but seeing that sign kind of freaked me out. Once off the bus, I tried to stay calm. While I was only in the staging area for about 15 minutes before the race started, I had to hang out for at least another hour (I lost track of time after that) before my start. It was REALLY hot. 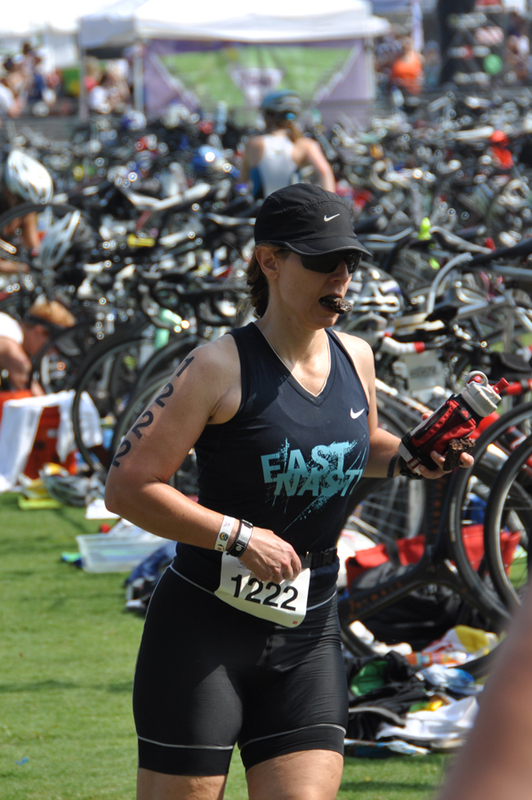 Fortunately, the race organizers had water and Gatorade out there for all of us. I was nervous, but nothing too bad by this time. I mainly just tried to stay cool until my number was finally called to the dock where the race officially started. Finally - my time arrived. There really weren't that many of us left at this point - only about 150 people. We lined up single file and headed down the stairs to the water. And this where where I started to officially lose my mind. Looking down the river, I quickly realized I COULDN'T SEE THE FINISH! I mean, think about this. You're getting into a river with God-knows-what in it and going to swim until when? YOU DON'T KNOW BECAUSE YOU CAN'T SEE THE FINISH! As I'm not one for hysterics, I just tried to stay calm. But this is all so new to me that it's hard to control the rational emotion that getting into that water was a really stupid thing to do. But I did. Couldn't make a fool of myself by running back up the stairs, right? So I got in. And I swam. And swam. And swam. And really didn't feel like I was getting anywhere. Have you ever seen that commercial where swimmers dive into a pool full of caramel? (If not, click here: http://www.youtube.com/watch?v=7JDXilnpj9Y) THAT'S how I felt when I was trying to swim. So then I started thinking "I'm exhausted. I'm never going to make it to the finish. WHERE is the finish? I should just grab a kayak." While I never felt like I was going to drown, I just didn't feel strong enough to make it to the end. TOTALLY FREAKED ME OUT! Fortunately, after about 10 minutes, I calmed down and just tried to remember anything my swim coach Helen told me since any technique I'd been taught had gone out the window. Reach - Rotate - Relax. Reach - Rotate - Relax. That pretty much became my mantra for the remainder of the swim. The good news is that I did NOT have to grab on to a kayak. The bad news is that my swim time was 32 minutes. Oh well. I survived and there is something to be said about that. I got out of the water and then had to run up some stairs to the first transition. Normally at this point, I'm all excited because I get to ride - my best event. But it was a real punch in the gut was to get to transition and to see almost everyone's bike gone but mine. I knew I started later than all of the other racers, but it still really made me feel, well - like I didn't deserve to be there. Plus, that swim was just so draining, I honestly didn't know how I was going to get through two more events. I was exhausted, plus I got a headache, which is rare for me. I did the best I could, but again, being seeded close to the end got to me. I was so far back that I was mainly seeded with the relay teams. Generally speaking, relays are filled with people who only participate in one event in which they're strong. So, if by some chance I beat a relay swimmer out of the water, I was most likely going to be passed by their rider doing the bike leg. And I did. I'd be riding along and all of a sudden this flash on a $10,000 tri bike would fly by. Pretty discouraging considering I'm usually the one passing people on this leg. I know this is going to sound pathetic, but I was on the verge of tears on more than on occasion during the bike. This was usually the easy part for me and it was just SO HARD! 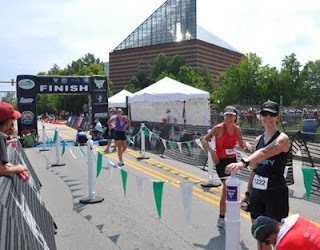 I don't know if it was the hills (it was HILLY) or the heat or defeated mental status - probably all three, but I remember thinking "This is the hardest thing I have ever done." Finally - it was time to run. I grabbed my hat and sunglasses, and shoved a Clif bar in my mouth and off I went. Nom Nom Nom... Clif Bar! Like the rest of the race, the run was hard. Worse probably because you really feel the heat when running. Again, my body just didn't want to do what I wanted. 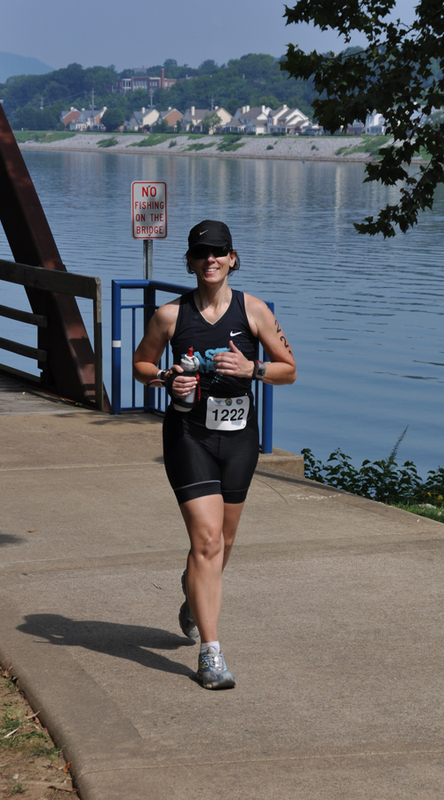 While I'm normally not a fast runner, I've learned can usually run my standard pace the first two miles of a tri. Not this time. I was a good minute slower than my usual race pace at first and only got slower. And I hurt. A LOT. I honestly almost cussed out my sweet husband when he came running up and tried to encourage me. Granted, he was giving me tough love and I REALLY just wanted a hug, but still - I shouldn't ever want to cuss out my husband. Especially since he's been so incredibly supportive of my new tri lifestyle. During my run, I questioned myself as to why I was doing these races and wondered how I was ever going to get through Augusta. Again, I got passed by all of these relay runners on fresh legs. It was really, really discouraging. Since the route was out and back - I got to see most of the runners on their way to the finish. That was hard too because I wanted to be on my way to the finish! I was in so much pain that I didn't even try to "just run to the next mile marker" like I usually do. No. It was run for 5 minutes, walk for 1 and repeat. After a while though, I started using any excuse to walk. Water station? I'm walking. Misting station? Walking. Hill? Walking. I think I walked more the second half of the course than I ran. But finally and painfully, the end was there. We had a great downhill to the finish so I was able to run the final 3/4 of a mile. It pretty much took everything I had to do it, but I made it to the finish. Surprisingly, I didn't burst in to tears at the end. I honestly thought I would. But all I wanted to do was grab a ice towel, find some shade and sit. Dudley was funny because the camera did something weird and he missed me crossing the finish line. He actually asked me to run through the finish line again for a photo! No. Freaking. Way. I was done. Me on the GOOD side of the finish line getting my timing chip removed. I have to say, though this race was really hard for me, the Team Magic crew did a GREAT job. It was well-organized with a ton of volunteers. They really tried their best to keep us cool: water stations o'plenty, a misting station, ice cold towels - it was great. Thanks to everyone who helped make the race possible. As for my future plans, well, I took two days off to recover. I guess recovering is too strong as I'm not sore at all. I just needed to regain my focus. This race really took a lot out of me mentally. While I knew I wasn't 100% ready for this race, I didn't think it would just kill me like it did. Some of that is my fitness level, but there were other factors as well - heat and mental toughness being two. I realized that while I wasn't as fit or mentally tough as I thought (I mean, crying in a race? Come on! ), I did actually complete the race. I didn't drop out and I really, really wanted to. Especially in the swim. That should count for something. I'm still a little discouraged, but think in a week or two I'll be able to look back and think I did something pretty cool. Maybe sooner as this morning, I signed up for the Fall Creek Falls Olympic tri on August 21. Training starts tonight. As I've mentioned, it's July and the Tour de France is on. To say I'm addicted to the Tour is an understatement. I watch / read everything I can about it. This year's Tour is particularly interesting in that there have been MAJOR wrecks almost daily that have taken out several major contenders including Bradley Wiggins and Chris Horner. In fact, many announcers / reporters have changed the name from the Tour de France to the Tour de Crash. Yesterday's stage was no exception to the carnage as Alexander Vinokourov, Jurgen Van Den Broeck and David Zabriskie all suffered Tour-ending injuries during a high-speed crash on a decent. Of course, in reference to the title, the wrecks are NOT the reason I love cycling. No, I love this sport because of what happened AFTER the wreck. You see, prior to this crash, the peloton was chasing down a group of 5 riders (called the breakaway). One of these riders - Thomas Voeckler - was only a 1.5 minutes behind the current Tour leader - Thor Hushovd - for the overall race lead. So if he finished 1.5 + minutes ahead of Thor, he would be the new leader of the Tour. This is important - remember this. When the wreck happened, not only did two of the main contenders (Vinokourov and Van Den Broeck) have to abandon the Tour, but several others either fell or got caught up in the ensuing mess and got left behind the peloton. Plus, several of the injured riders' teammates stayed behind with their team leaders to pace them back to the peloton (a practice common in cycling). The result being a split in the main peloton with main contenders in both groups. Now here is the best part - due to the extent of the wreck and that several of the race favorites were involved, the riders in the main peloton, including the current leader Thor Hushovd, decided to slow the peloton down until the extent of the injuries could be assessed and the lagging riders could catch up. That's right. Rather than taking advantage of their competitors' bad luck and charging full-ahead, the peloton slowed down! Remember - there is a breakaway ahead with a rider who would almost definitely take the Tour lead by this action. But Thor Hushovd was right there in the front row of the peloton, taking control and slowing it down knowing his race lead was slipping away. And it did. Thor lost the Yellow Jersey yesterday. So let me ask you - in what other sport do athletes not take advantage of their rival's misfortune? Crashes are a part of the sport. They happen all of the time. Why not take advantage? Because that's just not the right thing to do. The riders (with the exception of last year's winner Alberto Contador) believe the Tour shouldn't be decided by another riders' misfortune. And while the peloton can't wait for every rider every time, when the Tour is on the line, history has shown the riders will wait. And that's what I love. Viva le Tour! A Primer of The Tour de France. Finally! It's July! And for me that not only means summer and the celebration of the Fourth, but also possibly my favorite sporting event of the year - The Tour de France! For those of you who have never heard of Lance Armstrong, here is a little Tour primer. The Tour is a three-week bike race around France. No, it's not a consecutive circle around the country, but distinct stages that take place throughout different cities. Sometimes the riders leave from the city they raced into the previous day, sometimes they don't. It just depends on how the race organizers set up the race. There are 22 teams in the Tour, each with 9 riders. Every team is made of different specialists including sprinters, climbers, an all-arounder (also known as a general classification rider, or GC), and various other helpers called domestiques. The GC rider is a team's main rider and the one who has the best chance to win the famed maillot jaune (yellow jersey) in Paris, which is given to the man who completes the Tour de France in the least amount of time. All other team members ride in support of their GC guy. Riding "in support" could mean anything from getting water bottles to surrounding their rider to protect him from crashes to thrashing their legs while leading their GC rider up a mountain pass. This is why cycling is considered a team sport. Even the best GC rider wouldn't be able to win the Tour without a strong team helping him along the way. While the teams do ride in support of their GC rider, that doesn't mean there aren't other accolades for the other riders. The sprinters target certain stages with flat finishes where they can win that day's stage. The same goes for the climbers, as there are trips through both the Pyrenees and Alps. As with the best GC rider, the best sprinter and climber will also receive special jerseys at the end of the Tour (along with bonus money). There are also two races against the clock, known as time trials (TT). The individual time trial is exactly that, one man going as fast as he can for the length of the course. This year's Tour also featured a team time trial (TTT), which in my opinion is one of the most beautiful things in sports. All nine men working together as a unit to finish the course in the least amount of time. When done properly, it's a really cool site to see. So far this year, the Americans are doing REALLY well. Granted, we're only three days into the Tour, but the American team Garmin-Cervelo won the TTT on the second day, and American sprinter Tyler Farrar (from team Garmin-Cervelo) won yesterday's stage on the 4th of July. Pretty cool, I think! If you've never checked it out, try to watch some of the Tour this year. There is a lot more to American cycling than Lance. We have 10 Americans riding this year, which ties the record for most Americans riding in a Tour. There are also four VERY strong American-based teams. The Tour is on Versus pretty much 24/7 over the next three weeks, plus some on NBC as well. Take a look!